In 1990, over 200,000 Hindus fled their homes in the Kashmir Valley in India, under dire threat from Islamic terrorists. Forced to leave their ancestral lands and property, the displaced Kashmiri Pandits, as they are known, were rendered 'migrants,' — refugees in their own country. Their plight remains on the sidelines of the more public spectacle of the Kashmir issue. Many of them remain in camps, awaiting justice and a possible return to the place they called home. Others, scattered and settled across India, carry the scars of the tragedy within. 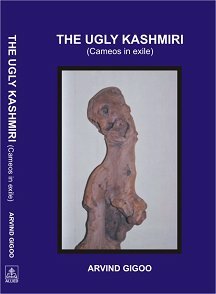 The Ugly Kashmiri (Cameos in exile) (2006, Allied Publishers) by Arvind Gigoo is a collection of short pieces, which touch upon the smoldering discontent preceding the forced exile of this community, as well as the traumatic hangover, post-migration. For the first time in Indian literature, a book dealing with the politics, sociology of a state and people has been written, using short pieces which are complete in themselves.The canvas of this book stretches far beyond the Pandit community to the other essential pieces that constitute the social fabric of Kashmir: the Muslims, the intellectuals, the militants, the security forces and the politicians. Sparing no one, not even the reader of the cameos, the author rips through any pretensions of patriotism or intellectual posturing, and exposes the hollowness within. A poignant and, yet, scathing comment on the Kashmiri ethos, these 180 cameos hold a mirror to the universal human condition of displacement, hypocrisy and betrayal. Each piece gets a page to itself, which intensifies the impact of the words. Although most of the cameos cannot be easily comprehended by someone from outside the context, the terseness and irony are hard to miss. A defiant and incisive look at a generation of people, each cameo is, as the author puts it, "a bleeding piece of truth," and loaded with multiple meanings. Some of the cameos compress historical and political events spanning several years. The second edition of the book (to be published) will contain a set of annotations, which can throw light on the amazing depth of meaning behind each piece. His last word was: "Shift!" >While in exile, Kashmiri Pandits shifted from rented house to rented house. They used the word "shift" for each move. Here, an old man is about to die. His dying word too is, "shift." There's a sense of ambiguity here. He is shifting to the next world. "What an artist lies in me!" >Nero's last words were: "What an artist dies in me!" In an instance of clever wordplay, the author uses the word "lies," in terms of how the actor inside a Kashmiri political leader lies to the people. This is an oblique reference, perhaps to Dr. Farooq Abdullah, the then-Chief Minister of Jammu and Kashmir. "Why did you go to the International Debating Club with the proposition?" "I had to make a second tryst with destiny." >The author makes a dig at Jawaharlal Nehru, the then-Prime Minister of India, who he's critical of, for approaching the United Nations Security Council with the Kashmir issue. Kashmiri Pandits regard this act as a major blunder by the former Indian PM. From Pakistan to plebiscite to India to Pakistan to independence to anything and anywhere is one breath. >A dig at the constantly changing political ideology of the Kashmiri Muslims. We nail this man for he is an informer. >This cameo is targeted at the dubious philosophy of the terrorists, who indiscriminately killed several Kashmiri Pandits and Kashmiri Muslims. "Who is the author of these cameos?" >The author ends his collection with a flourish of supreme irony. In this, the final cameo, he turns his keen gaze to the reader, anticipating the kind of response his work will elicit from his more conservative Kashmiri Pandit brethren. Here, two readers speculate on the identity of the author; the second speaker obviously hasn't relished the criticism of his community in some of the pieces. We don't know which community/religion the first speaker belongs to. Thus, before he draws the curtains on his final act, the author, rather provocatively, leaves the readers questioning their own convictions. Therefore, I am not where I am"
"I sold off my house and land and everything in Kashmir because Kashmir is my dear motherland." "Listen! How can I talk about the plight of Kashmiri Pandits? I am a secularist." "We must preserve our culture." The author states in the preface, "I have never had any political commitment and religious conviction. I go on changing my opinions. I dangle between an idea and its opposite. I am sure about my doubts, vacillations and uncertainties." He dedicates the book to an unknown "Ahmad the Blacksmith," whom nobody knows because in today's bruised Kashmir, beauty of the mind and soul have lost their significance. The author feels a deep "need for change from ugliness to beauty" which is palpable throughout the cameos. Truth is beauty and while the artiste pays a poignant tribute to his lost homeland, these pieces are also a wakeup call to the people to break free of the mire of sentimentality and accept the reality of their situation. Using an unconventional vehicle and armed with self-deprecatory wit, the author lifts the veil off a malaise that has been silently eating away inside a community for decades. Not surprisingly, The Ugly Kashmiri has caused quite a furor in the Kashmiri literary circle, with a critic calling it a "literary bombshell." It's not just the packaging of the pieces that is unprecedented, but also the driving idea behind it. A great deal of courage and honesty is required to provoke an entire community into confronting and, possibly, exorcizing the past. Per the author, the source of his cynicism is the pain and love he feels for all Kashmiris. The Ugly Kashmiri helps one fathom the ethos and soul of Kashmir, as well as of a highly marginalized section of its people, the Kashmiri Pandits. View the Worldpress Desk’s profile for Aishwarya Pillai.